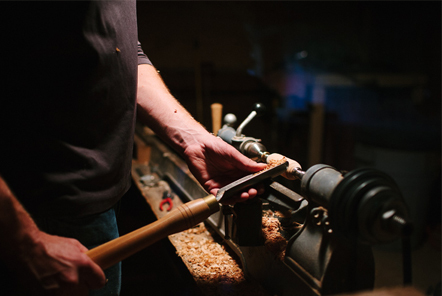 Our family has a heritage of woodworking here at Rockledge Farm. Four generations ago we operated a mail order business from the Farm, selling among other products produced, wood furniture. Today Rockledge Farm Woodworks is a small, family operated business. We are located on our 200 year old "hill farm", having converted barns for use as workshops, office, storage and Gallery .......and we still have some livestock on the farm! Our work is either inspired by working to fulfill the needs and desires of our clients, or by the piece of wood itself in the case of the One-of-a-Kind pieces we create from unusual and distinctive "Live Edge" or figured woods. One of our barns is a storehouse of these rare pieces of wood, where they may sit for years, waiting for the moment when a piece "speaks" to us, when suddenly the proper use for that wood becomes apparent. Much of the furniture we build is designed and made to our clients' order. Customers may select a purchase from items already made, or use the work displayed as a starting point from which to develop their own design with us. We are the antithesis of the "Production Shop" furniture business, which produce furnishings from a limited number of patterns and designs in their catalog. We prefer the experience of looking at each new project as a fresh start, working with our clients to develop a piece of furniture best suited to them. Rockledge Farm Woodworks also makes a number of accessories including Figured Hardwood Cutting/Serving Boards, Bowls and utensils, Jewelry Boxes, Game Boards and Tables, Bentwood Oval Ware, and many other items which may be seen at our Gallery, and in select galleries and stores around the nation. We endeavor to use woods which we know have been harvested in a responsible, sustainable manner. Unless otherwise specified by a customer, our furniture is constructed exclusively from native Vermont and northern New England Hardwoods which we carefully hand-select from a number of small lumber mills around us. Most of our furniture and accessories are made wholly or in part using "Figured" Hardwoods such as Birdseye and Curly Maple, Black Walnut, Cherry, Flame Birch, and Burls of the many hardwoods here in Vermont. By virtue of either the distinctive wood selected, or by the unique design utilized, (or both), every piece of work that is crafted at Rockledge Farm Woodworks is a "One-of-a-Kind", "One-at-a-Time", hand crafted heirloom.